I am watching the show on Samurai TV this week, so hopefully the clipping won’t impact my enjoyment. All wrestlers above have profiles on Joshi City, you can click on their names to go straight to it. We start, of course, with a rookie battle. AZM isn’t a rookie in the traditional sense as she is three years into her career, but she is only 14 years old. Hanan and Ruaka are both 12, with Hanan debuting this year. 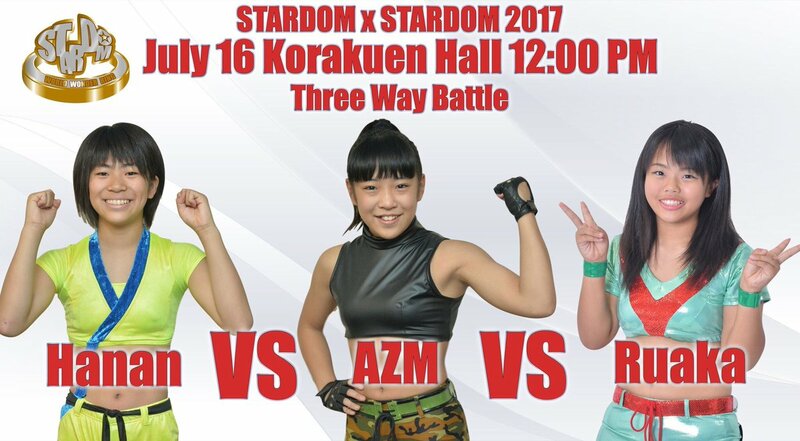 AZM is a former trios champion in Stardom, so she definitely comes in with the experience advantage. Ruaka and Hanan both attack AZM off the start but she stacks them in the corner and delivers a dropkick. AZM kicks both in the back as the 14 year old dominates her juniors, but Hanan and Ruaka soon recover and Hanan ends up double teamed by her opponents. Hanan kips up and knocks down AZM but she kips up too. AZM rolls up Ruaka when she goes to do her own kip up and they all trade roll-up with no one getting the three count. AZM ends up alone with Hanan, armdrag by Hanan but AZM hits a dropkick. Ruaka returns and puts Hanan in a crab hold, but AZM puts Ruaka in a sleeper from behind. Hanan recovers and puts AZM in a sleeper as well, AZM gets out of it and hits a double DDT on both her opponents before hitting rolling verticals on Hanan. AZM charges Hanan but Hanan blocks the Rolling Clutch, Ruaka runs in and boots AZM in the corner. Judo toss by Hanan to AZM, but Ruaka drops Hanan with a side Russian leg sweep. Fisherman suplex hold by Ruaka to AZM, but Hanan breaks it up. Hanan and Ruaka trade elbows until Hanan hits a running STO, she picks up AZM but AZM sneaks in an inside cradle for two. Hanan tosses AZM to the mat again, Ruaka boots Hanan and rolls up AZM for a two count. Japanese Rolling Clutch by AZM to Ruaka, and she picks up the three count! AZM wins. This is probably exactly what you’d expect – a few miscommunications, some cool moves from Hanan, and then a quick ending. Hanan continues to impress me the most of the rookies, the judo background really comes in handy, but nothing else really stood out. A typical start to a Stardom card, nothing offensive but nothing really worth noting. This is Shiki Shibusawa’s debut match in Stardom. She has been training in Stardom since last year, at 27 years old she is getting into the game a bit late and doesn’t have a background in any martial arts or wrestling. Natsuko is also a rookie, she debuted last fall and is part of Team Jungle. 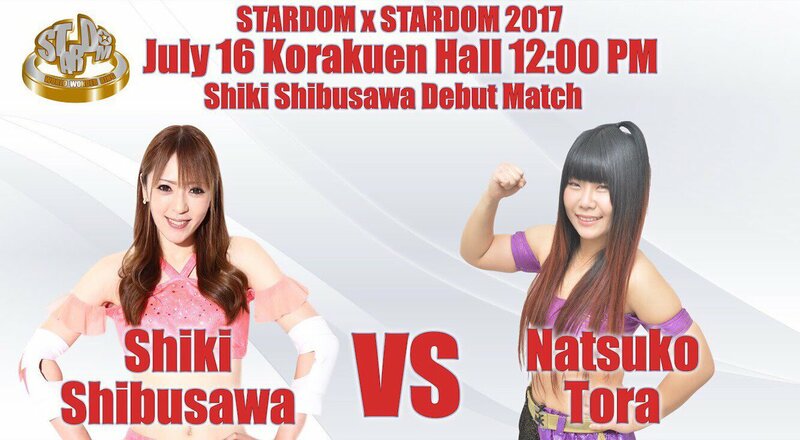 Natsuko was the oldest rookie in Stardom at 26 years old, so these two will likely be compared for quite awhile as typically the rookies over the age of 18 don’t stay in the opening rookie battles for very long. Natsuko has now cut her hair short, which I assume means she is stepping up her game. Natsuko starts with a wristlock and they trade holds, Natsuko stretches out Shiki before Shiki goes for a dropkick, but Natsuko avoids it and hits a hard shoulderblock. Sleeper by Natsuko but Shiki gets out of it, dropkicks by Shiki and she covers Natsuko for two. Shiki goes for a scoop slam but Natsuko reverses it into a slam of her own, she puts Shiki back in the sleeper but she releases her after a moment for two count cover. Natsuko tries to go up the turnbuckle but Shiki keeps grabbing her, Shiki dropkicks Natsuko to get her off the turnbuckle before dropkicking her into the corner. A final dropkick by Shiki, but Natsuko kicks out of the cover. Shiki gets on the second turnbuckle and hits a missile dropkick, but another pin fails as Natsuko gets a shoulder up. Shiki elbows Natsuko but Natsuko elbows her back, slap by Shiki and she rolls up Natsuko for two. Dropkick by Natsuko, she picks up Shiki and the two trade elbows. Natsuko drops Shiki with a series of running knees, she picks up Shiki and nails the F Crash for the three count! Natsuko Tora wins the match. Obviously, you can’t really judge a wrestler based off their first match. I will say that she faces an uphill battle, as she doesn’t have the background that generally leads to a successful career. She seemed a bit awkward at times with her movements, so while she may go on to have a long and successful career, there isn’t anything here that I can pinpoint as a sign of potential. Natsuko looked fine as the one ‘leading’ the match and I am sure they practiced this quite a bit, it wasn’t a bad match but a pretty typical debut match. Now this is quite an assortment of wrestlers. The “Gaijin” team is random as hell, as we get an American rookie (Gabby), a Luchadora veteran (Apache), and an 18 year old from the UK (Xia). This is also Apache and Xia’s first match ever in Stardom. The other side is more normal, as Hiromi and Konami have been a regular team the last few months and the child Starlight Kid tags along to join in the fun. I have no idea what to expect from this, but I’ve heard good things about Xia so I am looking forward to seeing what she can do. Apache and Hiromi start the match for their teams, Apache pushes Hiromi against the ropes and she gives a clean break. She does it a second time as well, Hiromi finally learns not to try to lock up with Apache and go through a fast sequence before squaring off again. Starlight Kid and Xia are tagged in, they trade armdrags but then tag out themselves as the last pairing comes in. 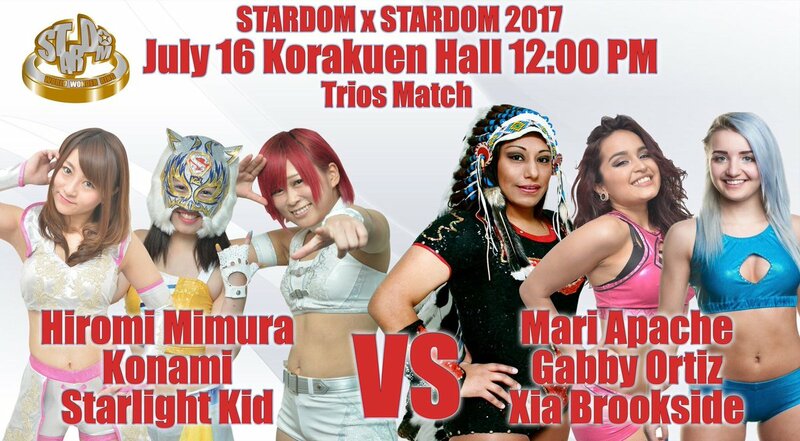 Gabby goes for a few flash pins on Konami with no luck, Starlight Kid and Hiromi run in the ring and all three triple team Gabby in the corner. We clip ahead a bit with Starlight Kid now being the legal wrestler, Gabby and Xia double team Starlight Kid before Gabby covers her for two. Dropkick by Gabby, she picks up Starlight Kid but Starlight Kid elbows her away. DDT by Gabby, but the cover is broken up. Gabby tags in Apache, Apache puts Starlight Kid in a rolling Mexican Surfboard before knocking her back into the mat. Modified STF by Apache but it gets broken up as well, Irish whip by Apache but Starlight Kid hits a spinning headscissors. Dropkick by Starlight Kid, she goes off the ropes but Apache levels her with a lariat. Apache picks up Starlight Kid but Hiromi and Konami run in to stomp her down, double dropkick to Apache and Starlight Kid hits her with a Tiger Feint Kick. Hiromi follows with a crossbody, standing moonsault by Starlight Kid but Apache kicks out of the cover. Starlight Kid tags in Hiromi, Hiromi goes up top and hits a diving crossbody for another two count. A La Magistral gets the same result, Hiromi picks up Apache but Apache hits a lariat. Heel drop by Apache, but Hiromi barely gets a shoulder up. Apache puts Hiromi in a modified Argentine Backbreaker, she drops her to the mat but Hiromi reverses the Michinoku Driver with a DDT. Konami runs in and kicks Gabby, but Xia hits her with a Codebreaker. Starlight Kid dropkicks Xia out of the ring but Apache levels both her and Konami with a lariat. Hiromi goes off the ropes but Apache rocks her with a lariat, Michinoku Driver by Apache and she gets the three count! Gabby Ortiz, Mari Apache, and Xia Brookside win! Most of this was pretty useless, but the one aspect I did love was that Mari Apache was working really snug which stood out since no one else was. Gabby, Xia, and Hiromi are all young and/or somewhat new to wrestling, so they are barely hitting each other, while Apache was happy to knock people’s heads off their shoulders. Besides that, the match was disappointing as I got to see very little of the young Gaijin do anything at all, and I’d like to see Konami doing something a bit more important. A forgettable match, aside from Apache destroying people. We have reached the title portion of the evening. The High Speed Championship is a mid-card title, and prestige-wise it is the fourth ranked singles title in Stardom. Still, it is very frequently defended as this is Kris Wolf’s 5th defense since winning the belt on February 23rd. 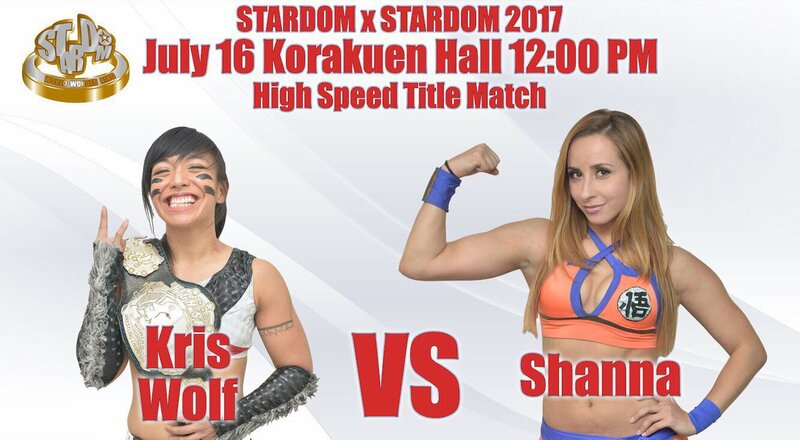 Shanna toured with Stardom last summer and even has had a shot at the High Speed Championship in the past, so she hopes to be successful in her second attempt at winning the title. Kris and Shanna quickly get into it, and living up to the titles name they have a high speed exchange which ends with a string of flash pins with neither getting the three count. They go into a Test of Strength, which Kris gets the better of, but Shanna hits a monkey flip before spinning Kris to the mat. Another monkey flip by Shanna and she hits a hurricanrana, cradle by Shanna but it gets two. Sliced Bread #2 by Shanna, she hits a trio of running elbow in the corner before applying a sunset flip for two. Double underhook backbreaker by Shanna, she goes up top but Kris rolls out to the apron before she can jump off. Shanna returns to the ring but Kris snaps her neck over the top rope, Kris stays on the apron too long however and Shanna boots her down to the floor. Kris trips Shanna and pulls her out with her before throwing her into the chairs at ringside. Chops by Kris but Shanna reverses an Irish whip and throws Kris into the ring post. Now it is Shanna that throws Kris into the chairs, she gets up onto the stage and jumps off of it with a crossbody onto Kris. Back in the ring they trade slaps to the chest, eye rake by Kris but Shanna applies a rolling cradle and holds down Kris for a two count. Release Tiger Suplex by Shanna but Kris gets back up and suplexes Shanna twice to the mat. Shining Wizard by Kris, but Shanna gets a shoulder up on the cover. Kris picks up Shanna and delivers a strike combination, release German by Kris and she hits a diving double knee from the second turnbuckle for another two. Kris gets on the second turnbuckle but Shanna clips her from behind with a crossbody, she goes up top but Kris climbs up with her. Shanna elbows Kris into the Tree of Woe but Kris avoids the diving footstomp, Kris pushes Shanna against the ropes but Shanna connects with a roaring elbow. Dragon Slayer by Shanna, she picks up Kris and nails the tiger suplex hold, but Kris barely gets a shoulder up. Shanna drags Kris back up and hits a second tiger suplex hold, and this time she gets the three count! Shanna is the new champion! I’m generally not a fan of wrestlers that don’t like each other teaming up for a title shot, and that is certainly the case here. 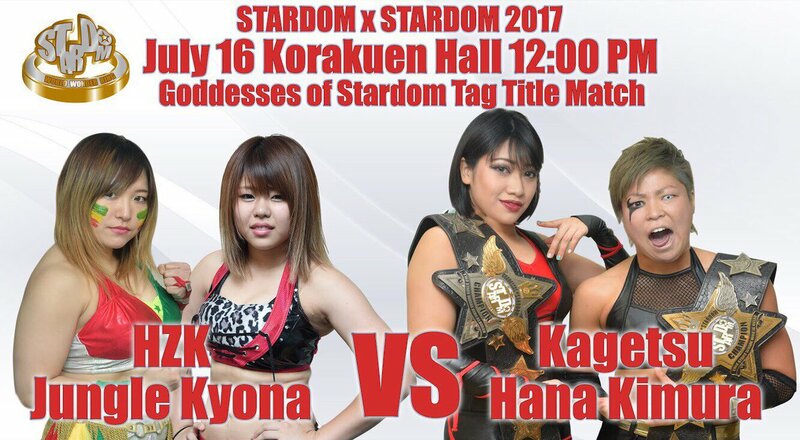 Kyona and Hiroyo Matsumoto lost the tag titles to Hana and Kagetsu last month, but instead of Kyona going for the belts with one of her stable mates, she is teaming up with her enemy in HZK. HZK of course is in Queen’s Quest, so it feels pretty forced that these two are together even though both are good wrestlers. Kagetsu and Hana are part of Oedo Tai, the cute evil faction of Stardom, so they will likely use some shenanigans to keep the belts around their waists. Kyona forces HZK to shake her hand before the match starts, but while they do so they are jumped by Hana and Kagetsu. Double dropkicks by Oedo Tai but HZK and Kyona roar back with strikes in the corner. HZK and Kyona accidentally collide with each other, and Oedo Tai takes the action out to the floor. HZK and Kyona are both thrown into the chairs at ringside. Hana eventually rolls HZK back into the ring and double teams her with Kagetsu, Kyona tries to help but gets choked by Kagetsu for her trouble. Hana picks up HZK but HZK fires back with elbows, Kyona comes in to help but HZK kicks her away. Elbows by Hana to HZK and she clubs her to the mat, Hana goes off the ropes but HZK catches her with a dropkick. HZK rolls to her corner and tags Kyona, shoulderblock by Kyona to Hana as Kagetsu comes in, but Kyona fights them both off. Kyona sets up both Hana and Kagetsu in the corner, she invites HZK back into the ring and suplexes HZK onto Hana and Kagetsu. Cover by Kyona to Hana, but it gets two. Kyona goes for a lariat but Hana ducks it, Hana goes for a high kick but Kyona blocks it and goes for a powerbomb. Hana punches out of the hold and boots Kyona in the face, dropkick by Hana but Kyona falls back into her corner and HZK tags in. HZK puts Hana in the crossface while Kyona keeps Kagetsu at bay, but Hana makes it to the ropes for the break. HZK facewashes Hana against the ropes, cover by HZK but Hana gets a shoulder up. HZK goes for the pump kick but Hana avoids it and hits a series of mounted punches. HZK returns the favor as they go back and forth, dropkick by Hana and she nails HZK with a running boot to the face. Hana goes for a sleeper but HZK spins out of it and hits a Codebreaker, giving her time to get to the corner to tag Kyona. Kagetsu is tagged in too and she dropkicks Kyona in the face, high kick by Kagetsu and she deliver the Ebisu Drop for a two count. Kagetsu tries to go up top but Kyona grabs her from behind, elbows by Kagetsu and she elbows Kyona until HZK comes in to help. Hana comes in too but HZK dispatches her, HZK slaps Kyona I guess to motivate her and they both toss Kagetsu into the air before hitting a double shoulderblock. Lariat by Kyona, but Kagetsu kicks out at two. HZK slams Kagetsu in front of the corner and Kyona hits a diving body press, but Hana breaks up the cover. Kyona picks up Kagetsu but Hana goes up top and drops her with a missile dropkick, HZK runs in and hits a Pump Kick onto Hana, but Kagetsu kicks HZK in the head and all four wrestlers are down. Kyona lariats Hana while Kagetsu takes care of HZK, Kagetsu and Kyona trade elbows until Kyona hits a pair of lariats for a two count cover. Kyona goes for the Hammer Throw Powerbomb but Hana comes in and boots her, chokeslam by Kagetsu to Kyona but Kyona gets a shoulder up on the cover. Hana and Kagetsu both boot Kyona, Ebisu Drop by Kagetsu in front of the corner and she nails the Oedo Coaster for the three count! Kagetsu and Hana Kimura are still the champions. And it is now time to see how the New Era of Stardom truly begins. After a six month feud, Mayu Iwatani won the World of Stardom Championship from Io Shirai in June, and now holds both the World of Stardom and Wonder of Stardom Championships. 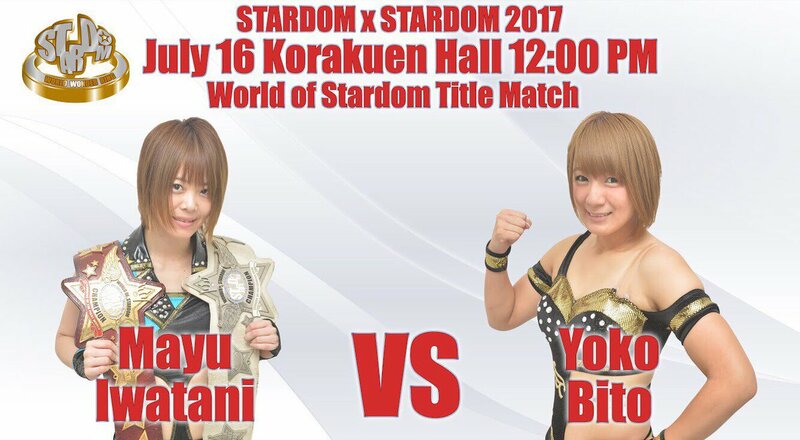 This is her first defense of the World of Stardom Championship as she faces a fellow Stardom original graduate and the former Ace Candidate. Since returning to Stardom last summer, Yoko Bito has had some luck and won the FIVE STAR GP last year, but has yet to win a major singles title. This is her chance to show that she is the true future Ace of Stardom, a title that Mayu just received and is in no rush to relinquish. Bito kicks Mayu as the match starts, they get into a fast exchange but end up squaring off on their feet again. They tie-up and struggle for position, Bito pushes Mayu into the ropes but Mayu hits a running elbow and kicks Bito against the ropes. Mayu picks up Bito and kicks her in the back, she puts Bito in an armbar before pushing her into the ropes and chopping Bito in the chest. Mayu dropkicks Bito in the corner, another dropkick by Mayu and she covers her for two. Bito pushes Mayu back and goes for a kick, but Mayu catches it and hits a dragon screw. Mayu works over Bito’s leg, she grabs Bito’s arm and hits a split-legged springboard armdrag. Bito lands against the ropes, dropkick by Mayu and Bito falls out of the ring. Mayu quickly goes up top and dives out onto Bito with a plancha suicida, she picks up Bito but Bito nails her with a kick to the head. Bito rolls back into the ring with Mayu slowly following, high kick by Mayu but Bito hits a release dragon suplex. Mayu and Bito trade elbows as they slowly get up, kick to the chest by Bito and she covers Mayu for two. Bito goes off the ropes but Mayu catches her with a superkick, Northern Lights Suplex by Mayu but it gets a two count. Mayu goes to the second turnbuckle and hits a diving footstomp, she then goes all the way up but Bito recovers and joins her. Mayu knocks Bito into the Tree of Woe and hits a footstomp down onto Bito, she goes back up top but again Bito recovers and brings Mayu back into the ring with a superplex. Now it is Bito that goes up top and she hits a missile dropkick, cover by Bito but it gets two. Bito goes for the B Driver but Mayu reverses it with a sunset flip, high kick by Bito and this time she delivers the B Driver. A second B Driver by Bito, she picks up Mayu but Mayu ducks the high kick and drops Bito with a release German. Kick to the head by Mayu, she goes up top and nails the Frog Splash for a two count cover. Mayu picks up Bito but Bito nails a spinning head kick, push kick by Bito but Mayu comes back with a superkick. Dragon Suplex Hold by Mayu, and she picks up the three count! Mayu Iwatani is still the champion. I am not sure if Samurai TV is going in a new direction or this was a one-time thing, but having each match slightly clipped probably isn’t ideal as it meant all the title matches were missing some of the action. That naturally led to the matches feeling disjointed, as none were long matches in the first place so some of the meat was gone. All three title matches ranged from good to very good, but they had the potential to be great if more was shown. The rest of the matches weren’t bad but were nothing special. Top to bottom a decent show, but not one of the better Stardom Korakuen Hall events in 2017.